﻿ DAN Boater at FLIBS 2015: "Safety Is First"
EK: Hey guys, Erik Kyle here, publisher of Great Lakes Scuttlebutt Magazine and I'm excited to be down at FLIBS, the Ft. Lauderdale International Boater Show, right here in sunny South Florida, and I'm having a wonderful time. As a matter of fact, while I'm here, I'm kind of wandering around and looking for some new and exciting products to report on and I ran across my man Greg Moore over at DAN Boater. Greg, how are you? GM: Good. Good to see you. GM: Yes, we were at Annapolis, yeah. EK: It's a really, really good product. 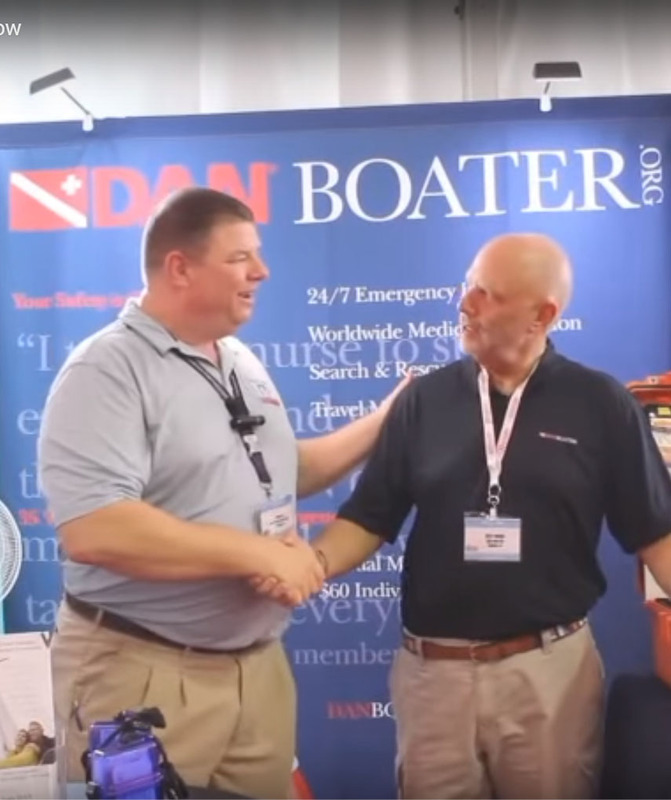 Tell us a bit about DAN Boater and what you guys do. GM: Sure. Well, DAN Boater is a new product. It's a membership product. We provide emergency evacuation and transportation worldwide, up to $150,000. And you only have to be 50 miles away from home for that to become effective. We've been doing evacuations and transportations in the scuba industry for 35 years and we know there's cross-over between our scuba members into the boating industry so we've introduced the new DAN Boater product for boaters. EK: You know, I absolutely love that. I've been a scuba diver my whole life and when I saw DAN Boater I was so curious, it was like "These are the people that will save your life. When you need help, these are the people that will come and give it to you." Now you're offering it to the entire boating community? GM: Absolutely. We have successfully evacuated and arranged treatment for boaters, as I said, for 35 years and we're happy to come in to the boating industry because we feel there is a valid need there. And, once again, you don't have to be out on your boat. If you're more than 50 miles away from home, and need to be transported elsewhere for proper treatment, your DAN Boater membership will be effective. EK: Greg, tell me about the cost for something like this because I know insurance gets crazy with a lot of their costs. How much is it going to cost me to buy this kind of product? GM: Well, annual coverage for an individual is $60 and for a family $100 per year. It's hard to believe but we've been doing it at that price, or close to it, for scuba divers and that's our roll-out price for the boating industry. EK: That's incredible. I mean, we travel a lot as a family. We have 3 little kids and my wonderful wife. And we travel to the British Virgin Islands, we travel down to Florida, we've traveled all over the globe, really. And so, what you're doing is telling me that for $100, no matter where we are on this planet, if we have a problem, DAN Boater will get us to a safe place for treatment. GM: That's correct. We will arrange your evacuation and we'll get you to the point where you can receive proper treatment. And one of the new features of DAN Boater is: you may elect to come back to the U.S. to receive treatment. You don't have to stay at the nearest facility you were transported to. EK: Yeah. Yeah, yeah. I don't want to necessarily go in to Tortola for my medical treatment, if I'm stuck down there. Nothing against Tortola. Fantastic product. I absolutely love it, Greg. Tell me, if I can't make it down to the Ft. Lauderdale Boat Show, where am I going to go online to find more information and be able to sign up for this? GM: That would be DANBoater.org. EK: Fantastic. Greg, thank you so much, my man. EK: Absolutely. Fantastic product, you guys. "Safety is first", boating or anything. DANBoater.org. Make sure you go there, check 'em out, and sign up as soon as you can. Thank you so much for your time today, you guys. We'll see you out on the water. Learn more about DAN Boater's exclusive boater benefits.